At Moth Removal St. Asaph, a part of Pest Control Wrexham we undertake all aspects of Pest Control and we can be at your property the same day for any Moth problems you may have throughout St. Asaph and surrounding areas. We keep our prices as low as possible as we cut down on our advertising, most of our work comes from repeat customers and word of mouth, you will also find that we have a friendly and professional team and we are all fully qualified in all aspects of Moth Removal. 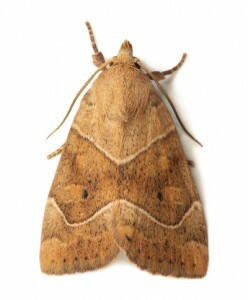 So if you discover that you have a Moth infestation, just pick up the phone and givePest Control Wrexham our helpful team a call today, we also work late evenings and weekends so we can be at your property in no time at all. Moth Removal St. Asaph offers you a No 1 Service at prices you can afford! Call Our Moth Removal Team at Pest Control Wrexham Today On: Quote Line 07916 322280. There are 2 kinds of clothes moths which are: The Case Bearing Clothes Moth and the Common Clothes Moth. Both Species evolved in a bird or animal nest and only eat fibres such as wool, fur and feather and they are most likely to go for clothes and carpets within a dark place where they are undisturbed. The clothes moth will hide in dark areas such as collars and cuffs and they also thrive on humid conditions. Sometimes the larvae of these pests can be quite active and could be seen crawling on clothes or on the floor. But besides feeding on clothes, rugs and carpets and household furniture the clothes moth will also feed on fur, stored wool and other similar articles, they also feed on pollen, hair, feathers and dead insects. The average clothes moth has a wingspan of approximately ½ inch, however the male is a little less, and their body is about ¼ inch long with a golden yellow sheen. Their eggs are oval and an ivory colour and the larvae is a shinny creamy whitish colour with a brown head.